Want a different item with this image (a mug, mousepad, etc)? Click here to let me know! Here's my "November 2009 project"! In this image I first tried to put into practice a method to pull the dust out that I had been thinking these past few days, and I didn't end up too thrilled about the results. It induced some "blur/denoise-like" effects early in the processing, and it also fabricated bloated star halos in the mid-sized stars (Rigel was put where it belongs with a quick HDRWT). So after the fact I went back and did some reprocessing from scratch treating large and small scale structures separately, then merged the results to the previous image. This helped me reduce some of the halos (I did't bother with the big ones because those are "optical presents" not the effect of bad processing), keep the stars under control, enhance the witch head a bit, etc. but didn't remove the denoise/blur effect on the background. I still think the initial processing thingy may work, I just need to play with it a bit more and be more careful next time... Nevermind the halo aroud Rigel is purple, although that's how it came out. The image is in fact a 2 pane mosaic with data from 3 frames, each taken from a different site, with a total exposure of almost 12 hours. This image was selected as NASA's Astronomy Picture of the Day on December 29th, 2009. and then also on November 1st, 2012. I have followed your work every since you joined TAC and I am amazed how technically proficient you are with complex imaging targets and techniques! Congrats, your work is inspirational to other imagers like myself. it's a amazing image! Your photos are diferent from other photos taken by most astrophotographers. I love your astrophotography work. Thank you for giving us this visual beauty. I have your photo as wallpaper in muy Macintosh. Esta foto es muy original, no recuerdo haber visto una semejante en la FADD. Aunque medio entiendo algunas cosas escritas en Inglés, adivino la descripción que haces de la foto. Me gusta mucho por lo original. Nuevamente te felicito, realmente me deleito viendo tu sitio DEEP Sky Colors. Zoila cualquier pregunta que tengas sobre las fotos, no dejes de preguntar, bien aqui o en mi correo que ya conoces. I say we change APOD to DSCpod..."deepskycolors picture of the day" because pretty soon you will be featured every day! Your work is an inspiration... would love to see some processing tutorials by you. Rogelio, ahora si que han publicado tu foto de la bruja en APOD, te lo mereces y de nuevo...¡¡¡felicidades por tu trabajo!!! Feliz Navidad y Prospero Año cargado de bellas fotos ;-) Un abrazo. Great work Rogelio. Congrats on your APOD. I really liked the framing with Rigel and the background stars. Hola Rogelio, qué alegría me da esta nueva APOD, tuya!!!!. Fíjate me encanta que la publiquen pues ya viste que desde que la ví me encantó y hasta hice la crítica que nunca había visto una foto ni parecida!!!. Bueno me encanta verificar que tengo buen ojo para catalagar fotos APOD. Nuevamente mil felicitaciones ahora y que el próximo año 2010, tambien sea un año en el que cada mes veamos una APOD tuya. Seeing your pictures I get logged amazed. I was all the sky and it was such imaging astronomical software added. More me your photos and put God and see your photos as big as God, I remember. Where am I the sky is mine, the window, love, earth is mine. Thanks. I'm waiting for your new عکسای. I am Mohammad from IranSeeing your pictures I get logged amazed. I was all the sky and it was such imaging astronomical software added.More me your photos and put God and see your photos as big as God, I remember.You write a poem of Iranian poet Sohrab Sepehri:Where am I the sky is mine, the window, love, earth is mine.Thanks. I'm waiting for your new عکسای. 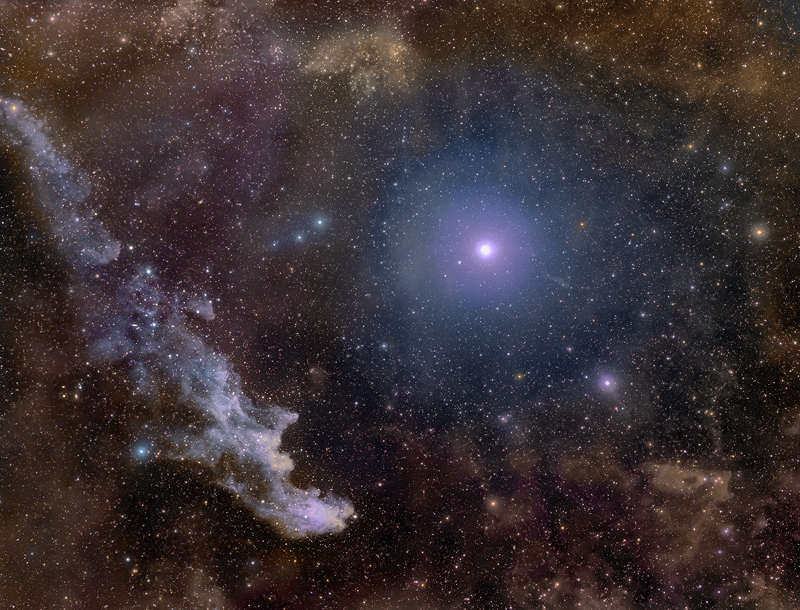 Witch Head Nebula and Rigel is great ,as is the Pale Blue Dot by Voyager . I wish i knew what we could see if we could build a telescope with resolution of 1 picoarcsecond....!!! How long would the sides of such a triangle be, and how long would be it`s base (in kilometers)...?